I’m thankful for all the protesters out in the streets today making it known throughout the land—our city will not tolerate hate! While there are some family-friendly protests going on this weekend, protests in general, are often not a safe place for families with kids. That said, I know we’re not the only parents with a need to take action, today and every day. Fear not, there are many ways to participate in pushing back against hate. In fact, anti-racist parenting is one of the MOST important ways we contribute to creating a tolerant, inclusive world. In fact, parents play an even more important role than schools, in the ways we “racially socialize” our children. 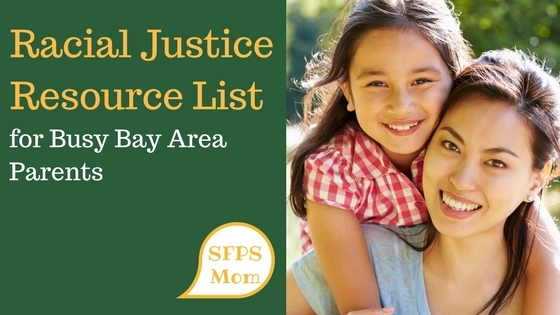 With that in mind, here’s a shortish list of people/organizations you can follow and support to get ongoing racial & social justice resources for your family. Find these groups on Facebook, sign up for their email lists, donate, volunteer, educate and taking action! My favorite mother-daughter duo, Staceyann Chin and Zuri of Living Room Protest do a great job of modeling conversations about race, feminism, gender and adultism. Check it out NOW! Their Medium blog posts short and nuanced discussions of race for families, centering people of color and other less heard voices (including White folks working for racial justice). Download the Tip Sheet and other resources from their website. Follow them on Facebook, Instagram. Follow this amazing group of educators on Facebook to find amazing events, workshops, and even a pre-school which educates children using a queer ecofeminist (and intersectional people of color led) lens. Help them increase access to their programs by funding their bus while you’re there. Our Family Coalition provides support, advocacy & education for LGBTQ families and works for equity. Their newsletter is full of great events, including an upcoming LGBTQ friendly preschool fair. Ask them to come talk to your school. SURJ organizes White folks to work for racial justice. The local group organizes monthly storytimes and family events with Abundant Beginnings, Our Family Coalition & other groups. Sign up here. Once you join, you can also become a member of their closed Facebook group. People of color led organization advocating for families in and beyond SF public schools. Donate to them, follow them on Facebook and Twitter, and support them. If you’re on the other side of an issue from Coleman, it’s time to give your position another look. The SF Families Union is a multiracial organization of families working for racial equity and meaningful integration in support of our public schools. Go to the website to attend an upcoming workshop or event. The SFPL has been putting on amazing programing about race and identity for all ages, keep an eye out! Next time you are there, check out the diverse book lists most libraries have in hard copy. Or, look for diverse books here. Want one simple next step? Have a racial justice movie night in your home, at school, or in other community spaces. It’s a great way to find like minded families & work together collectively to take on the subtle and not so subtle racism that’s everywhere. SURJ Families has an agenda you can use with a Raising Race Conscious Children Webinar. Or, you can adopt the agenda for other movie nights, for example, with films from World Trust: and/or Welcoming Schools. This post first appeared on SF Public School Mom. Check out more articles on race, parenting, and education policy HERE! ‹ A school assignment system for 2016 or the 1960s?